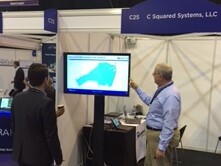 C2 Systems is exhibiting at the British APCO event being held at The International Center in Telford, UK from March 21-22. Visit our stand at C25 to learn more about how SitePortal® remote monitoring software works in the Public Safety industry. British APCO (B-APCO) is an independent user led, professional members association formed to promote, influence and advance the use and development of communications and information management for public safety professionals. It is at the heart of the UK’s public safety communications arena.